Road Trips are great. But let’s face it – driving the Interstate Highways can often be a bit boring. Mile after mile of sameness – the same signs, the same gas stations, the same chain restaurants. Sometimes the background countryside changes a bit. But the Interstates really are designed to get you from Point A to Point B efficiently. They don’t give travelers much of an opportunity to get a taste of America. To see and sample a more diverse and varied slice of of the country you need to get off the Interstates – off the beaten track – and explore the backroads of Non-Interstate America. I really enjoy the opportunity to do some off the beaten track travel. It’s refreshing and exciting. You never know what you will find. It was on one such excursion off the beaten track that I discovered The World’s Largest Ball of Twine. I’ve driven Interstate 70 between Kansas City and Colorado an untold number of times. 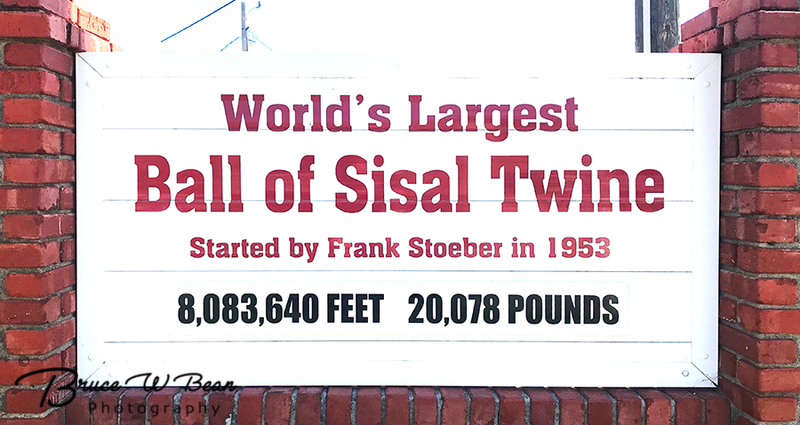 On each occasion, as I’ve passed through the Russell Kansas area, I’ve noted the signs pointing northward, enticingly suggesting a visit to Cawker City – Home of The World’s Largest Ball of Twine. Cawker City is located approximately 65 miles north of Russell, Kansas and Interstate 70, sort of midway between Kansas City – 230 miles to the east, and Denver – 380 miles to the west. Enticing signs notwithstanding, I had never deviated from my efficient I-70 route. Each time I’ve driven on past, maintaining my eastward or westward drive, intent on getting to my destination as quickly as possible. They say that change is good for the soul. With this in mind I recently decided to change things up a bit and get off I-70. 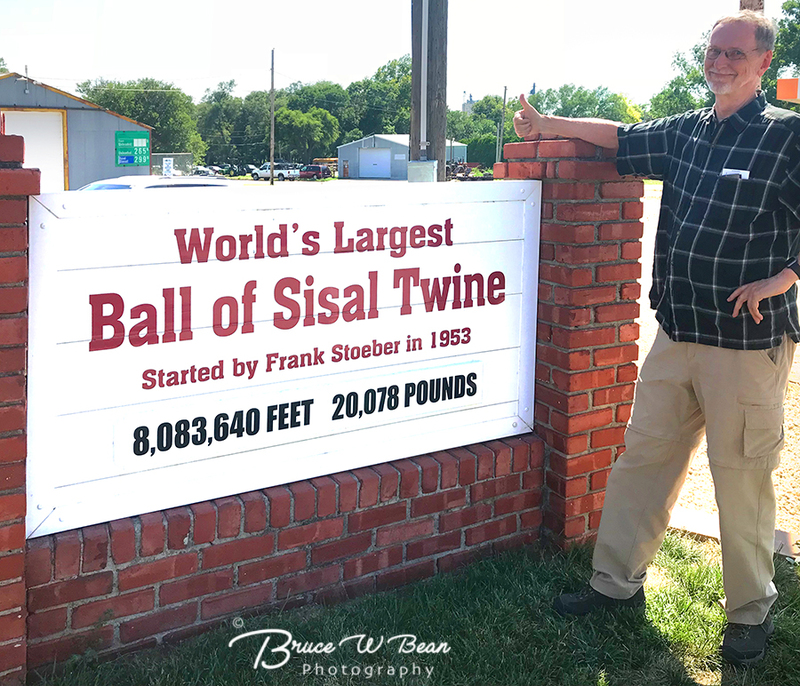 So on a recent summer afternoon, while tooling along the Interstate, I exited I-70 and urged my vehicle northward on Highway 281 out of Russell, Kansas, heading toward Cawker City, determined to finally visit The World’s Largest Ball of Twine. Now mind you, Cawker City is not a large place. Far from it. It’s reported to have a population of around 450 to 500. That’s not a number I can personally confirm however. As I drove down the one main street – Wisconsin Street which is also Highway 24 – in the late afternoon sun I didn’t see anyone – not a soul. The shops were closed, streets were empty and there was really no activity of any kind. With no-one to guide me to the location of the World Famous Ball of Twine I was left with only one option – I consulted Siri on my trusty iPhone. Fortunately, for once she did not disappoint. But then, it wasn’t much of a challenge. There is really not much else in Cawker City it seems and the Ball of Twine resides in a rather notable space directly on the main street near the center of town. 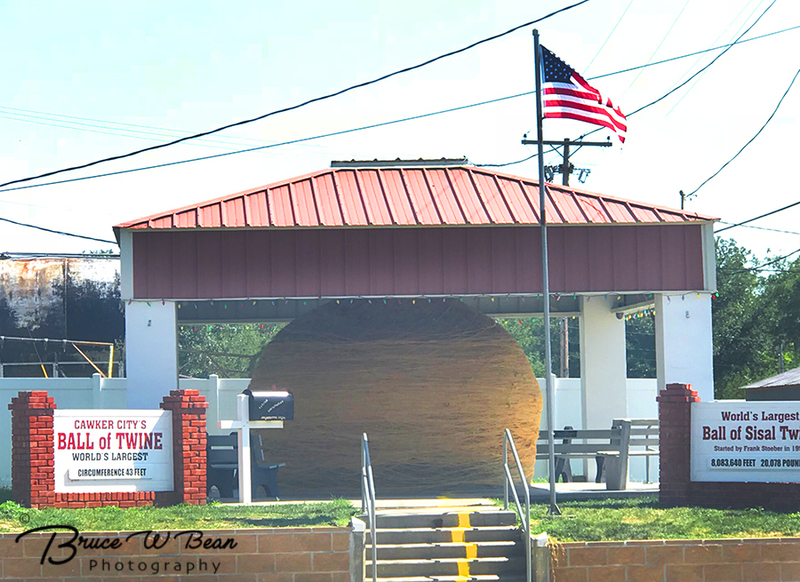 Clearly a source of pride to the residents of Cawker City, the ball sits under a red roofed canopy type building, an American flag out front and flanked by two large signs proclaiming to all it’s proud place of prominence in the Ball of Twine World. Other Cawker City Highlights – Once you’ve visited the ball of twine there is really not much of anything else to do in Cawker City – at least that was the case on the afternoon I visited. But as I wandered the town I did discover one other interesting site. 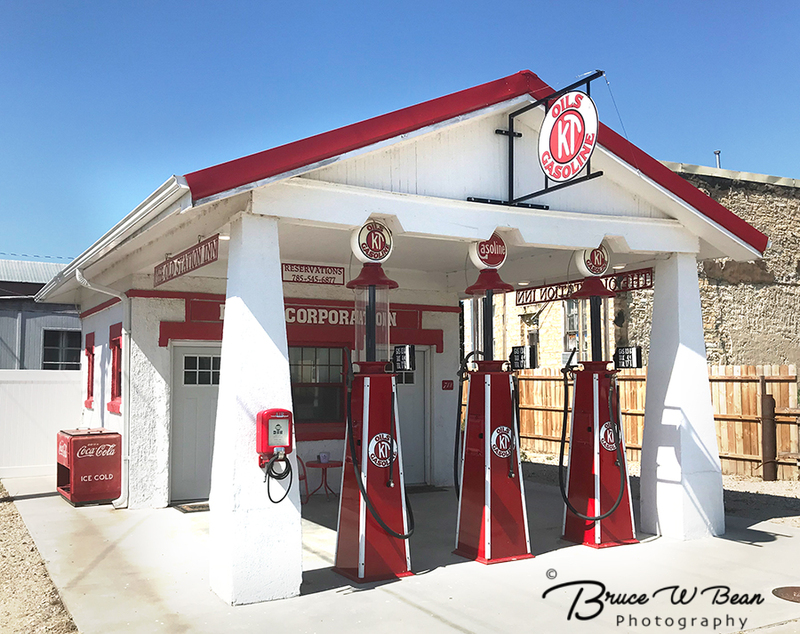 This fascinating old time gas station will have you thinking you are back in the 1930’s. It’s the station you would encounter while motoring along the winding roads of mid-America long before Interstates were invented. 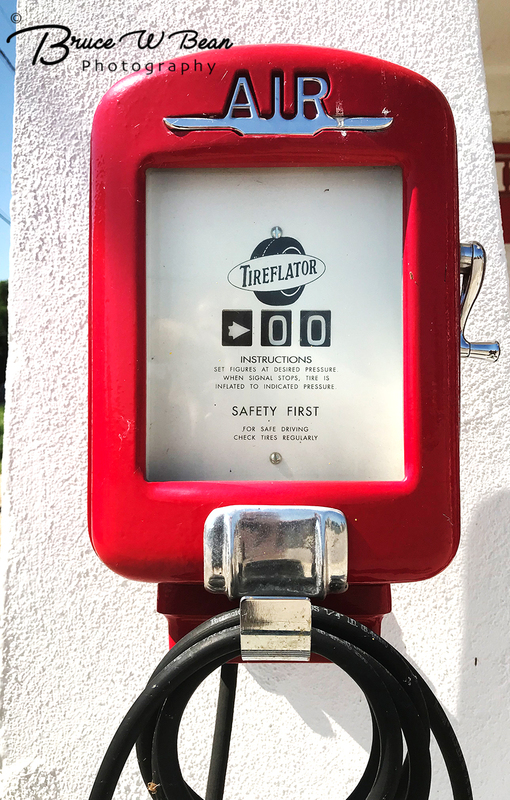 The remodeled and spiffed up vintage station sports three pumps in the front, a coca cola cooler on the side and an brightly painted “TireFlator” air supply. Alas – those items are just for looks – but they look cool. So there you have it – high adventure in Cawker City, Kansas. The next time your travels take you through Central Kansas you might think about getting off the beaten track a bit. Try hopping off the Interstate and checking out this dandy small town. After all – you could then join the ranks of a very select group of travelers – those who have actually seen and touched The Worlds Largest Ball of Twine. And if you time your visit properly and you need a place to stay overnight, I think The Old Station Inn might just be a dandy spot. It’s located directly across the street from The World’s Largest Ball of Twine so it’s easy to find – and you will have an interesting view as well. Sit back in a comfy red metal chair, sip a cool beverage of your choice, and let the sun set in the west as you gaze out at the vintage gas pumps and that great big, gigantic ball of twine. 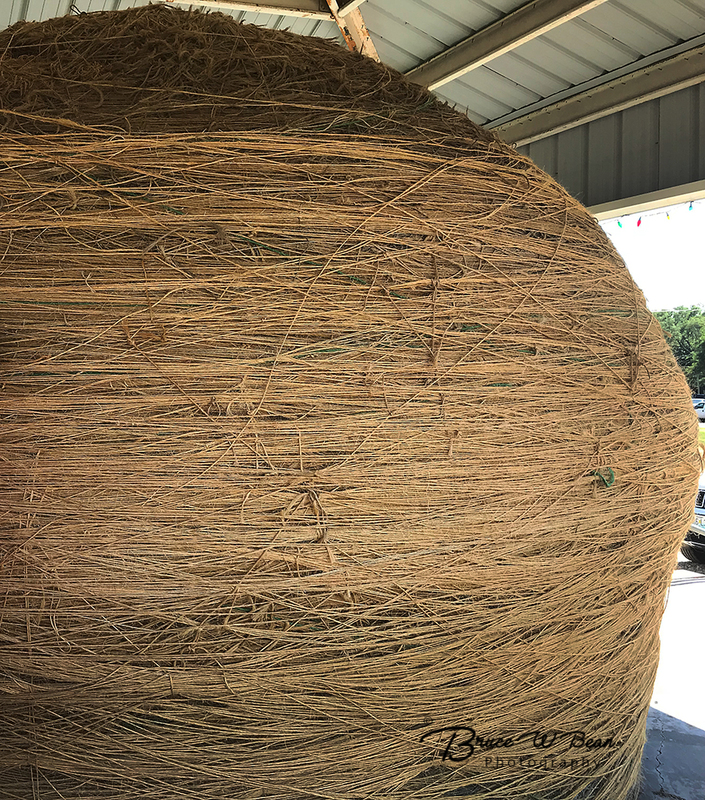 DISCOVER THE WORLD’S LARGEST BALL OF TWINE ………… ……………………………………………AND ENJOY THE ADVENTURE! ENJOY TRAVEL & DESTINATION PHOTOGRAPHY? 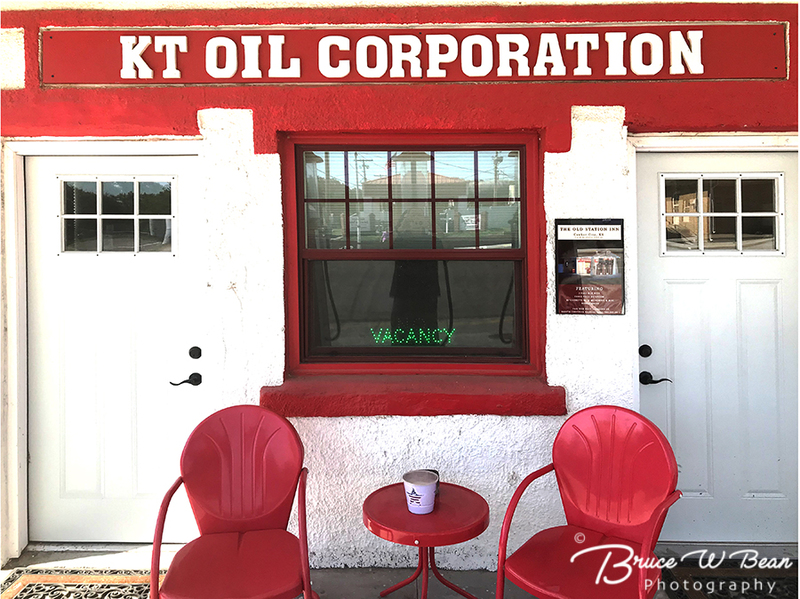 This entry was posted in General Photography and Travel, KANSAS, Off The Beaten Track and tagged Ball of Twine, Cawker City, kansas, Old Station Inn by Bruce W Bean, Ph.D. Bookmark the permalink.